OAKLAND, NE (May 2017) – Kitty Hoden, a registered nurse in this tiny rural northern Nebraska town, fell in love with the Democratic Republic of Congo (DRC) during a mission trip in 2014, when she visited a secondary school for young women. Now the Congo has come to her in the form of a dying baby girl. Ticvah Matumona’s family brought their now seven-month-old daughter with severe liver disease to the U.S. in February in hopes of receiving a transplant. Ticvah’s parents, Paulette Awetimbi and Luc Matumona, along with their six-year-old son Laël, traveled to Omaha after hearing of Nebraska Medical Center’s reputation with successful liver transplants. To pay for their plane tickets and medical visas, the family sold everything they had, raised money from fellow Congolese all over the world, and left their jobs in Congo. Luc has since learned that a transplant of this nature could exceed $750,000, and they do not qualify for insurance or Medicaid benefits. Despite the extensive assistance the hospital has already provided to stabilize Ticvah, the hospital decided this month that they cannot perform the transplant due to the high cost and inability of the family to receive follow-up treatment in Congo. Kitty and her husband, Steve, pastor of Salem Covenant Church in Oakland, Nebraska, learned of the sick child from a front-page news story in the Omaha World-Herald. 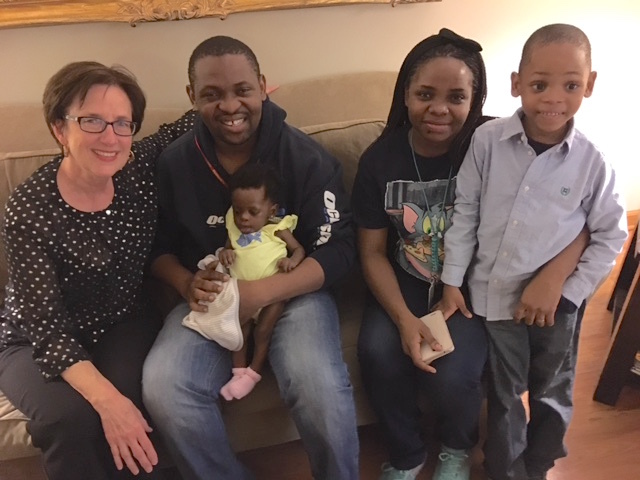 Because of her love for Congo she felt an instant connection to the family. Kitty had brought the newspaper along on the 60-mile drive to their daughter Laura’s home in Omaha to celebrate Steve’s birthday. The article said the family was staying at Ronald McDonald house, one block from Laura’s home. Kitty knew she had to try to meet them. Not knowing if they would be let in to the secure building, Kitty held the newspaper up at the door and told them she’s a nurse and her husband is a pastor. They asked to meet the family. To Kitty’s surprise they were let in. She had no idea when she walked through the door what a heartbreaking journey she had begun. At that point, Ticvah was four months old and weighed seven pounds. justice, healthcare, and the Congo. She asked people to pray or, if they felt led, to give a donation. By the next morning, she had collected more than $1,000 in cash. Kitty spent the following week talking to as many people as she could, collecting donations and gifts for the family. One retired teacher at the church made up a gift basket with books and toys for six-year-old Laël. The following Sunday, Kitty spoke at Salem Covenant Church, a congregation that is partnering with two other nearby Nebraska churches to sponsor a Paul Carlson Partnership health clinic in the DRC. The Hodens collected well over $9,000 that Sunday and returned to Omaha to deposit the donations into an account established for Ticvah’s health expenses. Ticvah and her family have moved into an apartment donated by an Omaha couple for the next six months. On her last visit, Kitty noted that the family is tired in every way but putting on a brave and courageous face as they choose faith, hope, and determination to obtain a new liver for their daughter. Even if they found a hospital willing to perform the transplant, that doesn’t mean Ticvah would receive a liver. The United Network for Organ Sharing lists more roughly 40 children under a year old in the United States in need of a liver. Supporters have set up a GoFundMe page.